This version of the Optimus is fitted with real-time octave band filters. The nature of "real-time" filters is that the meter measures in all bands at the same time - parallel filters. Octave bands gives a description of the frequency content of the noise measured. The most common use is for selecting the correct hearing protectors, ensuring that they attenuate the sound levels at the frequencies of interest. The NoiseTools software, which is included with this meter, has a calculator that takes the octave band measurement and calculates the assumed level at the ear when using different hearing protectors. For a full occupational noise assessment with detailed hearing protector selection, especially for areas with very high noise levels, we recommend the CK162C Octave Band Measurement Kit. This includes a suitable calibrator, carrying case and software. If you only need to carry out a basic occupational noise survey, still in line with the regulations, then see the standard Optimus Red sound level meter. 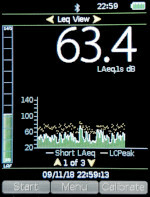 The meter's display shows the main parameters that are needed when making occupational noise measurements: LAeq or Lavg (average sound level), LPeak (maximum peak level) and the current sound level. With a button push or two, it can also show more detail, such as LEPd, TWA, dose %, exposure, octave band spectrum, memory and calibration status. Although the display shows only the commonly used parameters (Leq, Lavg, Peak, etc), the meter stores the sound levels for all time and frequency weightings, along with a time history for the more common ones and the octave band spectra. Summary - These "overall" values describe the noise for the whole measurement period. They include the Max and Min values for all frequency and time weightings, along with the all important Leq (A, C and Z weighted) and Peak (C and Z weighted). This version of the Optimus Red meter also has Real-Time (or "parallel") Octave Band Filters. The meter measures in all bands at the same time, storing the octave spectrum every second or every 1/2 second. When noise levels are very high, you need to be sure that the hearing protectors that are being used are adequate. The NoiseTools software takes the octave band measurements and calculates the level at the ear when using different hearing protectors. The Optimus Red was designed specifically for occupational noise measurements in line with the regulations. 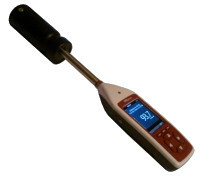 It provides all the noise measurement parameters that you need in a meter of the correct grade. For simple measurements it isn't necessary to download to a computer, you can read the summary information from the display. The main parameters for occupational noise are LAeq or Lavg and Lpeak, so you can just note these down. However, for a more detailed survey and for long-term records, it is better to download to the NoiseTools software. The downloaded measurements include the octave band data too, which is useful for assessing high-noise environments. The meter will start measuring the Leq, Lavg and Peak (the main parameters needed for occupational noise), along with a few other useful parameters. The meter will automatically store the LAeq, Lavg, LCeq, LPeak and a few others parameters. It will also store these every second, or whatever rate the meter is set to. You don't have to decide what to save as it stores it all. the meter stores the octave band spectrum automatically every 1/2 second. The measurement process is exactly the same as described above, no need to choose what you need. 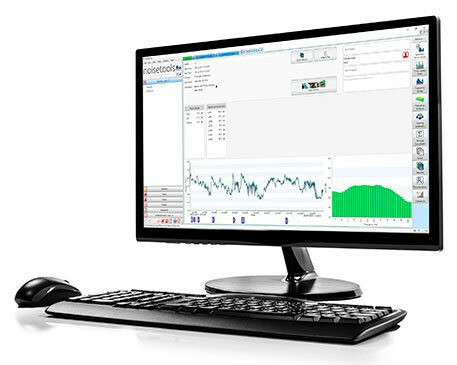 Octave band results can be displayed on the meter's screen or downloaded using the Noise Tools software for inclusion in reports or for analysing the performance of your hearing protectors. This meter and the noise measurement kits include the NoiseTools software - there is no extra charge for this. You can download the software to evaluate it before making a purchase. There are not too many options for this version of the Optimus Red sound level meter as most are included. It includes all the parameters that you need for occupational noise measurements in line with the regulations and directives. It also has real-time octave band filters fitted and comes with data logging and the NoiseTools software. The Noise Measurement Kits, order codes CK162C and CK161C, include a sound level meter (with octave bands), calibrator of the correct class, software, carrying case and download cable.